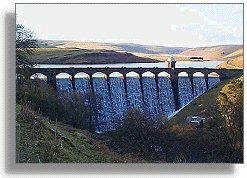 The highest of the series of four dams in the Elan Valley is Craig Goch. As it is the furthest up the valley from Rhayader it was also the last to be built, because work couldn't start until the new railway line reached the site. This was delayed by the rocky outcrop at Devil's Gulch, but work finally began in July 1897, which was about three years after the start of the lowest dam at Caban- Coch. This dam is a very attractive structure because it has a gentle curve in the dam wall from one end to the other, and has a series of curved arches supporting a narrow roadway above the dam. When the reservoir is full, water pours between the arches and into the valley below. Craig Goch dam also has a round tower with a domed top which contains the control valves. The photograph above is taken from an old 'Magic Lantern' picture on glass from 1904. It shows the huge steam-driven cranes working on the top section of the dam. You can see another picture of Craig Goch dam being built, also taken from these old glass slides, on the Elan Valley menu page.